This complete conversion jig system has been designed to be universal for the entire AR family of receivers including the AR-10's. It also includes a modification template for the Easy Jig router jig system (Both Gen 1 and Gen 2 along with 5D tactical) which is customer-provided. The sideplates of the UNI conversion jig have been modified to accept ALL of the different shapes on the forgings as well as their billet/polymer counterparts including Polymer 80 and James Madison Tactical. This kit accurately locates the 2 drilling holes as well as depicts not only the shape but also the depth specifics of the select-fire control pocket layout. The entire completion process is easily done with only a drill press and router. To see videos depicting both this item and the rest of my product line, click the links below. As is evident from the photos and video included here, much time was spent in the design and manufacture of this jig as well as creating the very detailed 5-page jig usage instructions with color 3D cutaway CAD drawings which include all listed (.001”) measurements which are sent via email upon shipping confirmation after the sale. Hardened steel drilling bushings have been inserted into the sideplates for BOTH auto-sear pin holes for long-term reuse. PLEASE WATCH THE VIDEO BELOW OF AN EARLIER REVISION FOR A BETTER EXPLANATION (on an older version). A patent has been applied for (patent pending). In addition, while the other Class II conversion angle-iron/leveling screw items (which cannot fit any polymer nor AR-10 forging version due to their outer raised ridges) only attempt to layout just one hole; my kit accurately locates both holes on both sides as well as includes the top (select-fire) milling template changes along with denoting the (3) unique depths of the auto-fire control pocket on the top. No other jig kit has anything remotely similar to these features. 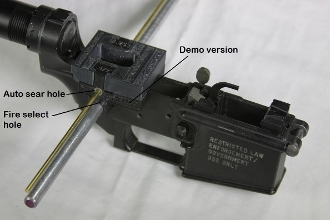 Also included in these instructions are the little known and rarely disclosed armorer’s techniques regarding the bolt/auto-sear release “timing” measurements which are done with a feeler gauge through the magazine well. I am about to introduce an auto-sear/bolt carrier kit for DPMS-friendly AR-10's. Those interested, feel free to contact me. This combo kit was produced due to demand by Class II’s for an inexpensive system to the widely successful Easy Jig router system for making AR-15’s and AR-10's from 80% receivers who don’t have ready access to a machine shop. Jig/template assemblies and all UNI parts in the photos are included (lower receivers and/or lower receiver parts kits and tools are not included). You have to select 1 of the 3 given template modifications (Gen 1, Gen 2, or 5D Tactical), you do not get all 3. This fixture may be lawfully owned by anyone, but ALL NFA RULES APPLY regarding the use of some of the features incorporated into this product. You (the purchaser) are solely responsible for how this item is used and I (the seller) shall not be held accountable for any misuse of this drilling/milling jig by you (the purchaser), whether Class II or not. Unauthorized conversion/possession of a firearm changed from semi into select-fire without BATF approval, is illegal. All parts included are either “New or Old Testament Scripture Engraved”, if that offends, please purchase another product from another vendor. My products are made in America, by an American, for Americans. I constantly review my product line, if an enhancement is made, the newer model may differ somewhat in color and/or shape from the one shown. I also have all parts kits (3 but not 4 position fire control parts), BGC assemblies, and complete SBR upper assemblies available for purchase. ALL NFA RULES APPLY. Currently I also have a complete 80% AR jig/assembly system, as well as an AK-47/74 Class II jig for the 80% pre-bent and heat treated receivers, an H&K flat template, a semi to select fire jig for existing HK rifles, and a semi to select-fire conversion jig for the SEF trigger pack which does not corrupt a semi auto receiver, a Class II AK-47/74 conversion jig for semi to full conversion, a locked slide conversion (for suppressor use) for the GSG 1911-22 and a Ruger 10-22 80% jig (also with locked bolt drill-in locator) on-line now. This jig along with all of the others that I design, manufacture, and sell, was “over-engineered” for those who value their time and money. Since I have attempted to foresee and surmount any and all possible errors which could happen during your construction(s), the possibility of your making mistakes approaches zero. Nothing is more disappointing than a mishap that requires a replacement receiver. Not only is there a monetary loss, but there is also the frustration factor due to the lost time in the work thus far, perhaps a broken tool or fixture, then there is the wait involved for the replacements to arrive from the other supplier via shipping. Now what should have been reasonably fun has become work. Those frustrations only follow my competitors’ sales and not my clients. In my efforts to make this the finest, most accurate jig available, I continually re-examine my product line and I also listen to any and all suggestions by my customer base. That being said, there is always the possibility that an update/revision has been incorporated and the product may have changed in either shape or color from what has been pictured. Regardless, the functionality for which the jig was designed for will ALWAYS be enhanced with each revision. For those who are curious about what the Bible says about “gun control” 2000 years ago, look up Luke 22:36. Thank you for your attention and good luck with this auction. An addendum for those who understand: I was a pre-trib person. I am very disappointed to say that “window” has now closed. Therefore the next 7 years are only going to get increasingly difficult. It is now your responsibility to do what is necessary to protect your loved ones as we move forward. I was faithfully hoping I would get to miss all of this. Don’t ever forget that the Supreme Court has ruled that police (at any level of government), DO NOT have the constitutional duty to protect you. That is and always has been solely up to you. Due to this round of gun control debate, demand has really spiked and I am doing my best for next day turn around. Sometimes that cannot be accomplished, please be patient. THANK YOU. Copyright © 2014-2019 Machinegun Guy. All rights reserved.